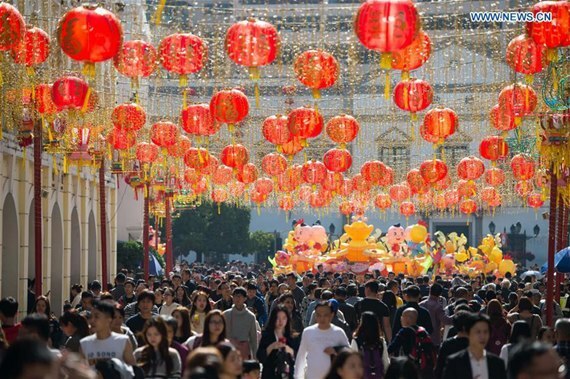 A record 6.15 million trips were made by Chinese mainland tourists to overseas destinations during the seven-day Spring Festival holiday, which ended on Thursday, according to the China National Tourism Administration. That is an increase of 7 percent compared with last year's Spring Festival. About 374,000 trips were organized by travel agencies, a 2.5 percent increase. The administration also reported growth from individual and high-end travelers and said that in addition to first-tier and coastal cities, inland cities－such as those in the Guangxi Zhuang autonomous region－became important source markets for China's out-bound tourism industry. With many Chinese now traveling abroad for Spring Festival, their choice of destinations has expanded along with their growing interest in exotic cultures and services. Those traveling to Japan, for example, where "shopping spree" became a catchword in 2015, now prefer a physical checkup or experiencing Japanese culture. Meng Fanhai, owner of a tourism agency in Tokyo, said his agency arranged more than 200 physical checkups and medical treatments in 2016, up 50 percent from the year before and accounting for about one-third of his agency's business from Chinese tourists. Li Xuejing, the agency's marketing manager, said Chinese tourists are increasingly willing to experience local culture and characteristic services, including staying in private homes, appreciating bonsai and watching monkeys in hot springs. Yang Min, a partner of a tourism agency specializing in receiving Chinese tourists in Kenya, said the country was unfamiliar to most Chinese in 2005. However, since 2010, more Chinese tourists have chosen the African country as a destination to experience its biodiversity. A Chinese tourist surnamed Guo, who was vacationing on an island in the Philippines, said she now pays more attention to relaxation and enjoyment during the holidays instead of shopping or choosing gifts for relatives. "When I book a hotel, I will take into consideration the massage, the spa and other special services ... to enjoy myself," she said. Another choice is Britain. Though the devaluation of the pound is a factor, Britain's rich history and famous education tradition have caught the eye of Chinese.